TippingPointStocks.com a Long Term growth stock advisory service aiming for 50-200% gains per position! Just launched October 4th 2017! Join now at Charter Member Rates! Only a few memberships left of 200! Charter Member rates gone shortly. Another week, another new high for the SP 500 and other indices. 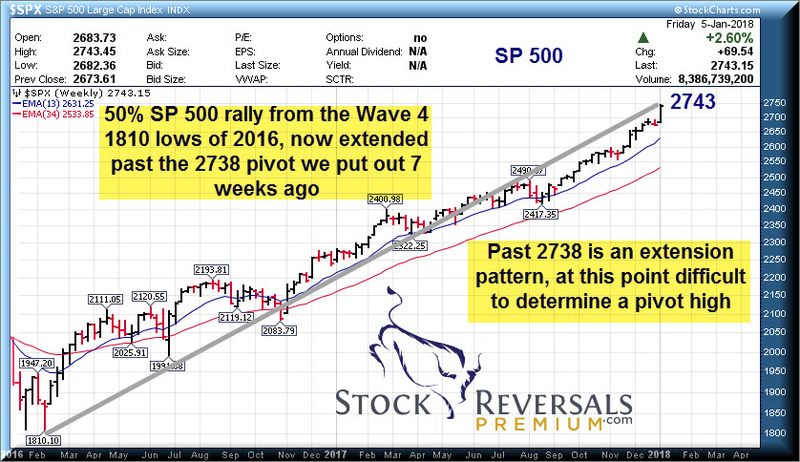 We had been looking for a high end of 2738 on the SP 500 for 6-7 weeks now, and we hit it this past Friday with a close of 2743 on the SP 500. The market is now officially extended in terms of the type of Fibonacci and Elliott Wave analysis patterns that we use to forecast. This being what appears to be an overall 5th wave of a 5 wave bullish pattern, anything can happen now in terms of getting more overbought or a fast reversal to the downside. Clearly the market is rapidly pricing in the benefits of a 21% Corporate Tax rate vs 35% prior and that can be hard to forecast on it’s own. 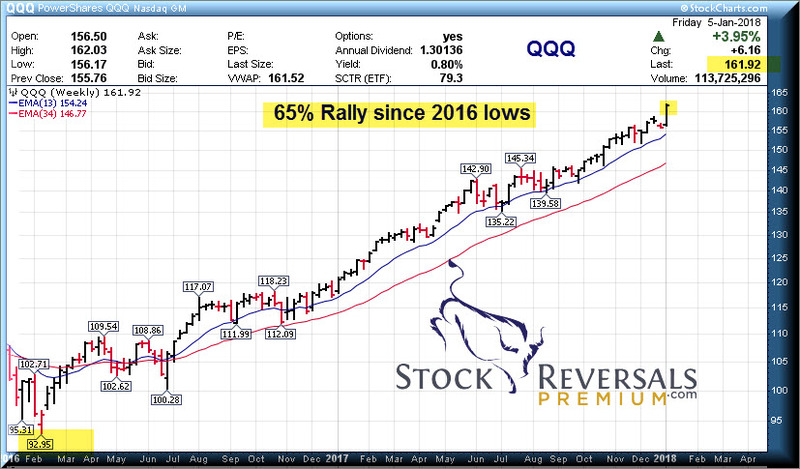 This weekend we are going to look at a few longer term charts from the February 2016 lows to current to give some perspective on this rally. The small caps up 71%, NASDAQ 100 up 64% and the SP 500 up about 50% since the 2016 lows. SP 500 showing 50% gains off the 2016 lows. 5 points past our 2738 pivot and stretched. 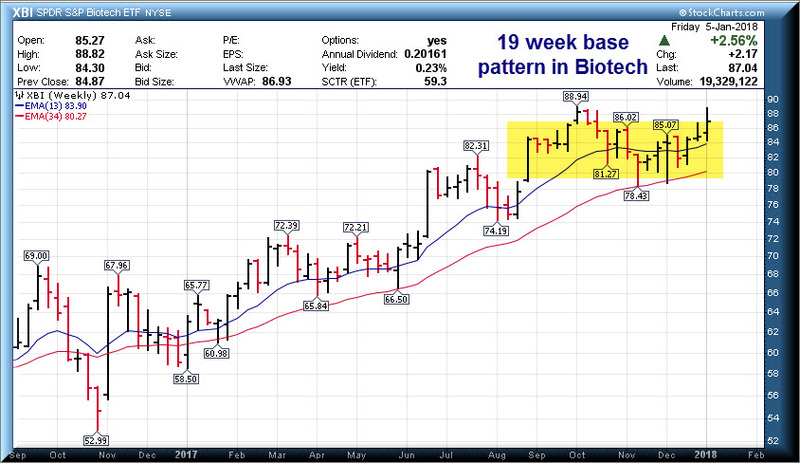 XBI: Biotech in a 19 week base pattern, looks like it wants to breakout. 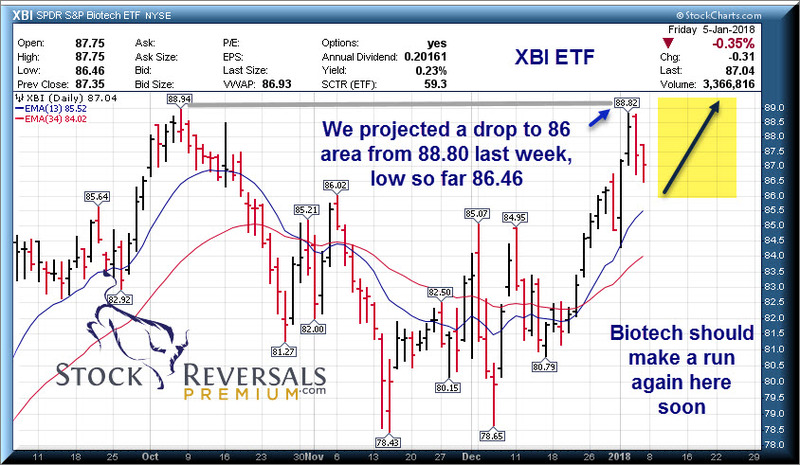 This past week at SRP we updated our Members saying a pop towards 89 should be met with a 3 point or so pullback to 86 area. We hit 86.40’s late in the week and bounced. This sector could break out soon. XBI Daily View: Classic double top pullback, should push and try again to break old highs. 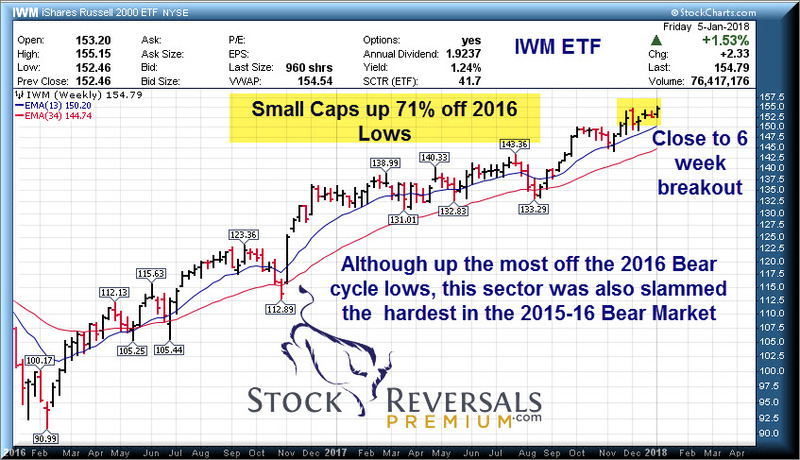 IWM: Small Caps on a percentage basis up the most from 2016 lows, but they also took the biggest hit in the last Bear cycle 2015-16. Close to a 6 week base breakout here. Have you looked into our TippingPointStocks.com Growth Stock Service? 155% and a 90% Gain already!! For a limited time you can join under with $500 off using our discounted Charter Member Rate while still available. A long term growth stock service aiming for 50-200% gains on each position with an active long term portfolio. We aim for 15 stocks eventually and currently have 6. One of which is up 155% and another is up 90% . Read up and consider joining! We have less than 10 memberships left of 200 maximum, they will be sold out within a few days we think if not sooner. 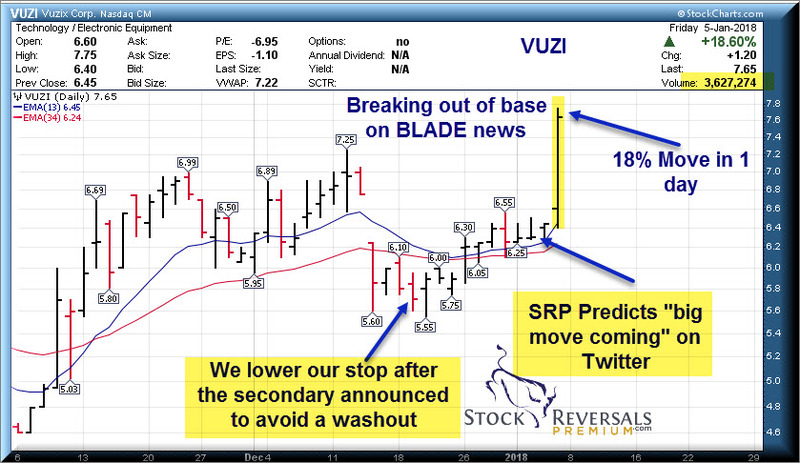 Swing Trading: VUZI Sample- Moving stops and understanding the fundamentals. We had a period recently at SRP where we were telling our members to be patient, many of our open swing trades were forming 6-8 week base patterns, and sometimes you cant always get alpha. However, we focus on fundamental analysis of every stock we swing trade, and then look at the chart pattern and try to marry them up. We do not mind waiting a few weeks for a move either. We also try to avoid washout stop loss runs, often computer generated and taking traders out of good companies for no reason. We use stops near the close of the market, not intra-day for a reason. Case in point this week is VUZI. This one was breaking out over $7 per share, and then obviously smart money got wind of a secondary at $6.05 per share and the stock began to decline. Finally the secondary was announced and the stock washed out to 5.55 area, we lowered our stop from 5.85 near close to 5.60 near close. As of Friday, about 10 days or so later the stock was trading at $8.80 in after hours. By moving the stop and understanding the fundamentals of the company we had an open swing trade in, we avoided getting washed out of a good trade. Now SRP Members are firmly in the black on this trade with average entries from 6-6.75, and some lower. We felt it could run up to as high as $10 into the CES conference and we are moving in the right direction. 18% Move in 1 day…. worth the wait. We also have several other positions that did nothing for a few weeks, but again we focused on small cap names thinking they would get their day in the sun. Many of our swing positions were popping late in the week in our favor, proving again that fundamentals and proper chart analysis combined can pay dividends for the patient trader. OLED: 9 week base pattern, LED’s for consumer electronic markets.